-What's Happening In Your Brain? No doubt none of us want to be a scatter-brain wondering where we left our keys, canvassing an entire parking lot in search for where we parked our car. Nor would we consider stumbling around in the dark when we can flip a switch and turn the lights on. How do we connect that to our brains? . After all wouldn't it be nice to see what goes on in there? Well we can get a pretty good idea through studies done. After 20 minutes of sitting quietly and on the right 20 minutes after walking. It is plain to see the contrast brain that is being oxygenated with rich red blood cells and endorphins are dancing to the beat of the heart, the brain is ILLUMINATED, as compared to one that is idle or sedentary. These visuals below have motivated me time and time again! . Here are just TEN good reasons to safeguard your brain with exercise and good nutrition. 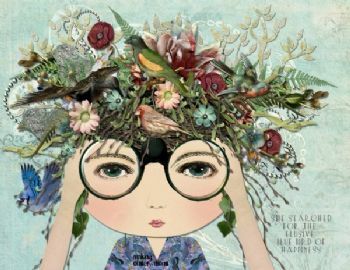 Where would we be without a clear thinking mind encased in a healthy brain...:: Let's keep those neurons fired up and as we engage in activities and nourish well, likely we are caring for the rest of the body too. Thanks for sharing these Illustrations! Exercise does more then just tone our muscles! Thanks for the info! Thank you for your brain blog. I have had a concussion and now I have to go a second time. I fell last winter and I was alone unconscious in my front yard and the grader was scraping ice so there was a racket when I came round. Short story, I have had hours of the books and numbers and geometrics . I just found your Brains lighting up. Now my brain will light up again. I love to fast walk and after that time I was dawdling. I have another appointment but I am going to cancel it. I feel OK and I will re-start my walking, it does makes much better sense to me. Pat in Maine. This is such a important reminder. Great post! Thanks for the great blog Sis! This is awesome -- it is good to see scientific proof of what we know is true!!! I know I read this blog but somehow didn't comment, I remember thinking what an awesome post it was and so informative. The pictures really speak volumes. Don't know how I missed it, guess we are even, LOL! Great blog. Nothing like seeing what is happening to our brains in simplified colored diagrams. How do you argue with that. You don't so get up and exercise. I need a copy of this on the front of my kitchen cabinet. 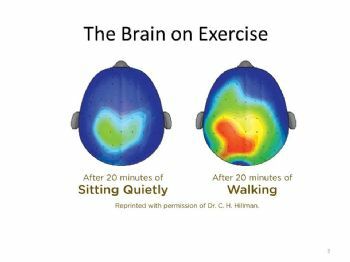 Great blog, very interested to see what exercise can do for your brain and body. Thanks for sharing. Exercise helps in so many ways. Take a look at those who exercise and those who don't. The difference is huge. Good blog. Over the past couple of months I have noticed an improvement in my memory. I figured it was because of my daily consumption of blueberries and flax seeds. It's probably my increased amount of exercise. for this info. A very powerful reminder to get up and move more! For sure!! Love the brain pictures. 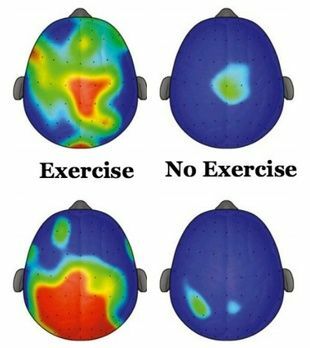 Great blog - I can attest to this research and the brain benefits of exercise. Thanks, Jan. I learned something which is always a good thing. This blog is a keeper for future reference, but the message is loud and clear! Thanks for doing such a great job of keeping us educated. Wow... really makes you stop and think about taking care! Those pics sure do make a visual impact! I didn't want to really go for a walk today, but I did and do you know I felt even better afterwards! Like you said-good for lifting your mood! I can't wait to get back to the exercise but doc says I have to wait for a while. Absolutely true. I believe in the power of exercise, wish it was easier! Yes, the slightest bit of movement will help, continuing exercise sends that oxygen where it needs to be. Oh wow! That is amazing! It's neat to see how exercise helps us. Those listed are all the foods I love. Growing up my favorite was pumpkin seeds, Brazil nuts and Hazlenuts. 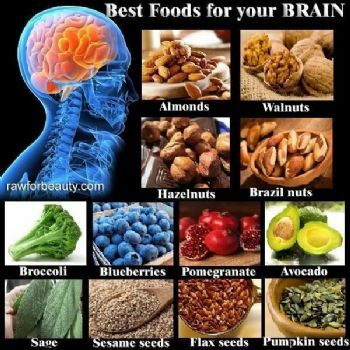 (Plus a lot of different nuts and seeds. Sometimes it takes a couple of tries to get my brain started in the morning. But exercise keep it running smooth all day!